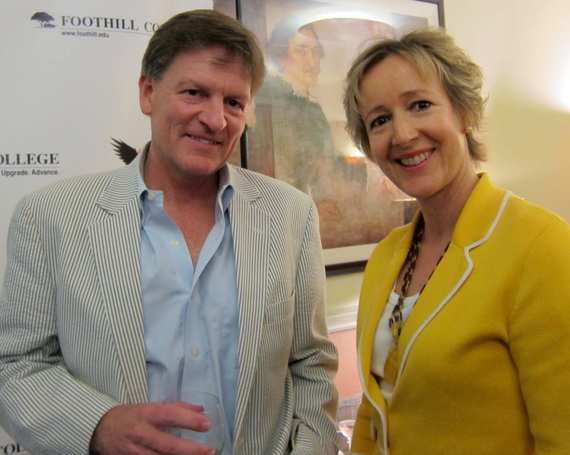 This week, I had the pleasure of meeting the talented and influential author, Michael Lewis. You probably know he wrote Moneyball, The Big Short and The Blind Side and has been compared favorably to literary genius, Tom Wolfe. But did you know that Lewis has almost finished a prequel to his huge bestseller, Moneyball and it will be published in December 2016? Although his publishing schedule precluded him from accepting an in-depth interview with me (for the BBC), he did agree to one in December. So, not a strike out, just a delay in play. It's been eight years in the making, and he's completed about 45,000 words (that's approx. 150 pages). He'll send his trusty editor at Norton the remaining chunks every six weeks and is on schedule for a September completion. He says "once it's on track, it's like a freight train." The topic? It's about sports (well of course, but possibly just football) and analyzes the distribution of pay across teams. As with most of his books, it's a character driven story, featuring people who surprised him and are in a situation that forces them to reveal their true character. On The Big Short Movie: Lewis described it as "a relief" to see how good the movie was and praised the talent and craftsmanship of the production team. He called out Christian Bale for his exceptional performance as Michael Burry, the Silicon Valley financial whiz, whose character "led us through the jungle of complexity." Lewis explained that Bale spent a day with Burry and was able to channel his breathing and his awkward mannerisms with incredible accuracy throughout the movie. Lewis also praised the straight to camera moments, especially Margot Robbie in the bathtub and lamented the production limitations of being a mere writer. Ha! Maybe that's why he's working on a new screenplay now. He didn't feel ownership of the movie as he'd sold the rights, and didn't sit on the set since he considered it "a pointless exercise." He was, however, involved in promoting the movie with the cast and says they're really "not that good looking," with the exception of (gorgeous) Brad Pitt. In Lewis's opinion, their star appeal is more to do with their force of personality and talent. He added, "I'm not a good judge of male beauty." That got a huge laugh from the audience. What other projects (books, screenplays) is Michael Lewis working on? What does he think of the Panama Papers? Donald Trump?